Leadership Communication Speaker, Joe Curcillo's Book: What’s Your Freakin’ Point? Do you want your words to be clearly understood? Then you’d better have a freakin’point! Skilled presenters and speakers understand the need to be on point: They know how to deliver a message that draws people in willingly. 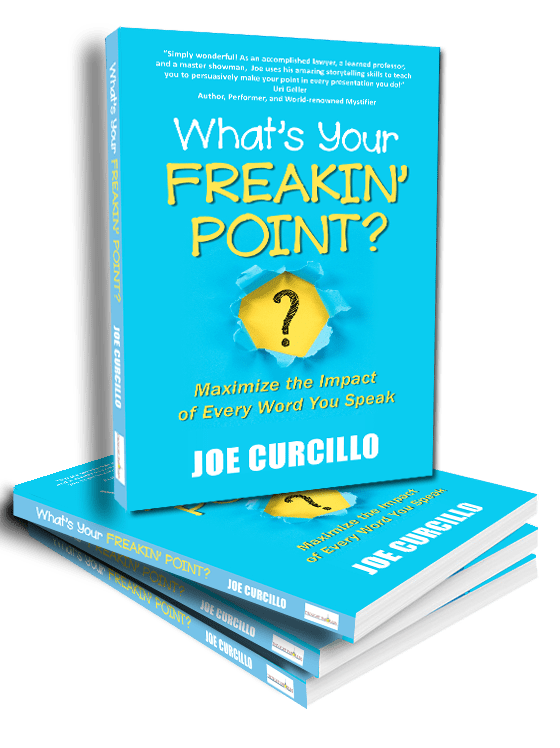 In What’s Your Freakin’ Point: Maximize the Impact of Every Word You Speak, Joe Curcillo shows you how to be an engaging, credible, and powerful presenter. He shares his lifetime of experience as a courtroom lawyer and a professional entertainer to help you maximize the impact of every word you speak to get your point across! For information on Joe Curcillo’s LIVE presentation on this topic, go HERE! You, too, can communicate with power and precision every time you speak. What’s Your Freakin’ Point? will show you the way.